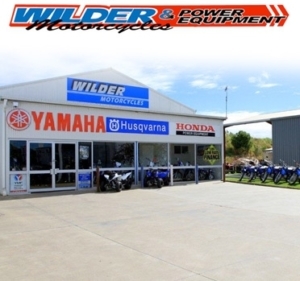 Wilder Motorcycles & Power Equipment was established in June 2006 in Young NSW. The business commenced in 2006 as a Yamaha Motorcycle dealership, and dealers for Honda Power Equipment and Husqvarna Power Equipment. Our business has continued to expand over the last four years seeing the addition of Honda Motorcycles to the range in November 2010, and Sherco Motorcycles in 2015. Our spare parts department is able to assist in providing your spare parts for all major motorcycle brands, as well as providing spare parts and accessories for your Honda and Husqvarna Power Equipment Products. The spare parts department can also assist you with a wide range of road and off road motorcycle accessories including tyres, oils and lubes, protective equipment helmets, pants, jerseys, gloves, armours, boots, goggles, bags, hats, shirts and loads more exciting gear. We also stock and supply accessories for the ATV including spray tanks and accessories, trailers, tool boxes and tool trays. Our service department is able to service your motorcycle or power equipment products. We specialise in Honda, Sherco and Yamaha Motorcycles; Bad Boy Mowers, Honda and Husqvarna Power Equipment. The workshop is also equipped with specialised motorcycle tyre fitting and balancing equipment. Book your motorcycle, ATV or Power Equipment unit in to our fully licensed workshop by phoning 6382 5927. Wilder Motorcycles and Power Equipment was Established in 2006, opening with Yamaha Motorcycles, Husqvarna Power Equipment and Honda Power Equipment. In 2010 Wilder Motorcycles and Power Equipment expanded their range and included Honda Motorcycles. 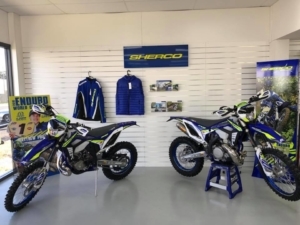 In 2015, Sherco Motorcycles were introduced into our range of Motorcycles. In the First year of including Sherco Motorcycles into our range, we were announced the Sherco NSW Dealer of the Year. 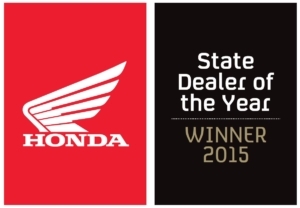 2015 – Wilder Motorcycles and Power Equipment were announced the Honda NSW State Dealer of the Year. The business has expanded again, only with space not range. 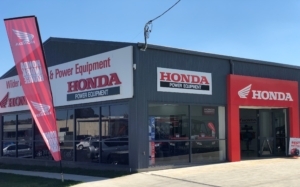 In July 2017 we opened the doors to our New Honda showroom at 163 Lovell Street, Young. 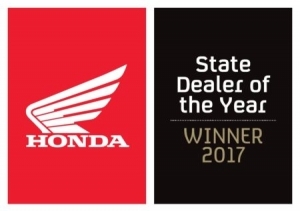 With the ongoing support from our customers and hard working team we are proud to be the 2017 NSW Honda Dealer of the year. Darren and Tanya would like to thank our valued staff and customers for supporting the dealership to achieve this significant award. It was time for an update in our main building, the Yamaha Showroom got a much needed extension and make over.